From humble southern beginnings Boris Rogers aka Bluz has risen through the ranks of spoken word entertainment. He is the slam master and coach of SlamCharlotte, a competitive team of poets whom he led to back to back National Poetry Slam victories in 2007 and 2008, something that has not been done in slam poetry for 15 years. He is also currently ranked 13th in the world for Poetry Slam after competing in Vancouver, Canada at the Individual World Poetry Slam competition. Bluz is the 2008 LEAF Festival poetry slam champion. 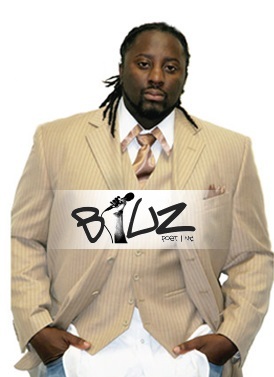 In 2003, Bluz solidified a spot as the official Host & Master of ceremony for the literary Café during CBS Radio’s marquee event For Sisters Only, which led him to hosting a segment on Charlotte s #1 urban Radio station Power 98fm with No Limit Larry and the Morning Maddhouse show entitled Spoken Word Fridays boasting over 22.5 billion listeners every Friday Morning at 7:50am. Bluz success with the show landed him a feature poet spot on the Morning Maddhouse 2006 College tour, which brought awareness of HIV/Aids to the students of Historical Black Colleges, and Featured as part of Essence Black family Reunion. spoken word workshop. An active member in the community, Bluz has worked on several projects with organizations such Junior Achievement, Charlotte Chamber of Commerce, Blumenthal Performing Arts Center, HBOs Def Poetry, The Afro-American Cultural Center, Wachovia, Bank Of America, CBS Radio, Radio Disney, ESPN, SPEED TV, BET, and NASCAR where he wrote and performed several intros for the Nationally televised showed NASCAR:TODAY. Bluz has also performed at the International Fringe Festival in New York and several productions throughout the United States. Bluz has shared the stage with several distinguished poets, Taylor Mali, Nikki Giovanni, Sonia Sanchez, Gil Scott Heron and he has opened for many national recording artist such as Outkast, Amel Larrieux, , Little Brother, Pink Floyd, Last Poets, D’Angelo, John Legend, Soulganic, Del La Sol, KRS ONE and has performed for many of our nations distinguished business leaders such as Jerry Richardson, Ted Turner, Earl G. Graves, Bob Johnson, and others. He is the author of a book of poetry(Articulate Slang), released 3 cds, and featured at world famous Nuyorican poets Café and Bowery Poetry Club. All of these accomplishments pale in comparison to his role as father to three beautiful children, husband to a dynamic wife, and friend to a core of poets known as the Concrete Generation who constantly help him push the limit of poetry. Bluz remains a visionary in the art of spoken word and slam poetry. His relentless pursuit to reinvent himself and the art form keep him in the upper echelon of poetry. This is Bluz.